Google today is launching a major update to Sheets, its Google Drive spreadsheet app that’s part of Google Drive productivity suite. 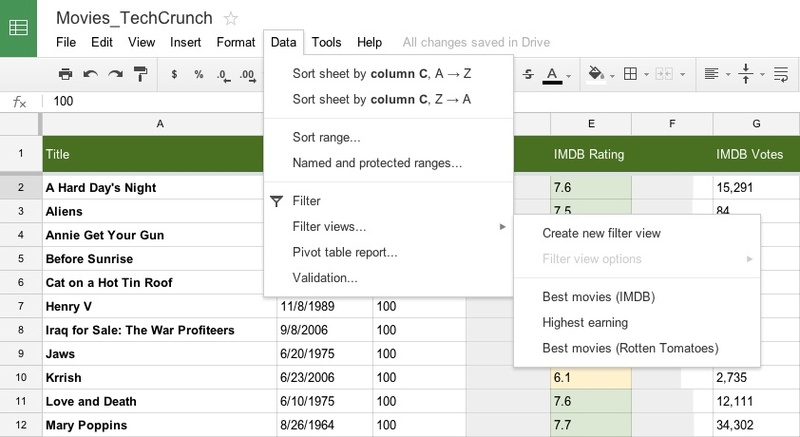 With this new version, Sheets joins the rest of Google’s productivity apps in letting users create and edit spreadsheets offline, a feature many of Google’s users have long been asking for. Anybody who has already used Google Docs or Slide offline before will be able to use this feature immediately. Everybody else will have to follow these instructions to get going. Just like with Google’s other offline apps, all your changes will be automatically synced back to Google Drive once you are back online. Also featured in today’s update is a new way to make collaboration in Sheets easier. Previously, whenever you changed how you viewed the spreadsheet, everybody you collaborated with saw the same view. Sometimes, however, different users want to filter the data in different ways while still working together on the same spreadsheet and data. With the new “Filter Views” feature, Sheets now lets you create custom views that don’t influence how others see your spreadsheet. Google also says that it made a large number of performance tweaks to Sheets that now make it feel significantly faster, especially when working with very large and complex spreadsheets. Indeed, this update removed many of the limits that previously governed the maximum size of the spreadsheets it could handle. Other updates in this version include a new in-line help system that adds links to Help Center articles and a bit more guidance when you start typing formulas, the ability to change the colors of different tabs in Sheets and a couple of similar minor changes. Over the last few weeks, Microsoft has been attacking Google’s Chromebooks with the argument that they don’t offer any offline editing capabilities. Today’s update isn’t likely to make Microsoft stop its latest “Scroogled” campaign, but it definitely takes the punch out of it.